As the NHL season heads into the playoffs and the St. Louis Blues prepare to take on the Winnipeg Jets in the first round, I had the opportunity to take a deep look into some advanced statistics. Overall, the Blues look favorably compared to the Jets as I discussed in a recent article. With that being said, there are definitely some interesting insights I found when parsing through the data that the Blues should take into account. Hockey is a game of percentages. A player shoots on the net, and the puck goes in a certain percentage of the time. A team that controls the play as measured by Corsi (CF%) for more than 50 percent of the time often wins on an aggregate basis. However, many of the matchups that happen within a game do not occur on an aggregate basis. Oftentimes, matchups are happening between two opposing lines, or between a goalie and a shooter, or between a defenseman and a forward. A team can win the game if they win the correct matchups, even if they have worse overall play. Teams should focus on increasing their odds of winning at a matchup level in order to push the overall percentages in their favor. Jordan Binnington is the biggest reason for the Blues’ incredible turnaround this season. He has played phenomenally well, but his quality of play actually leads us to understate his importance to the Blues. To be frank, the Blues are a different, better team in front of him than they are in front of Jake Allen. 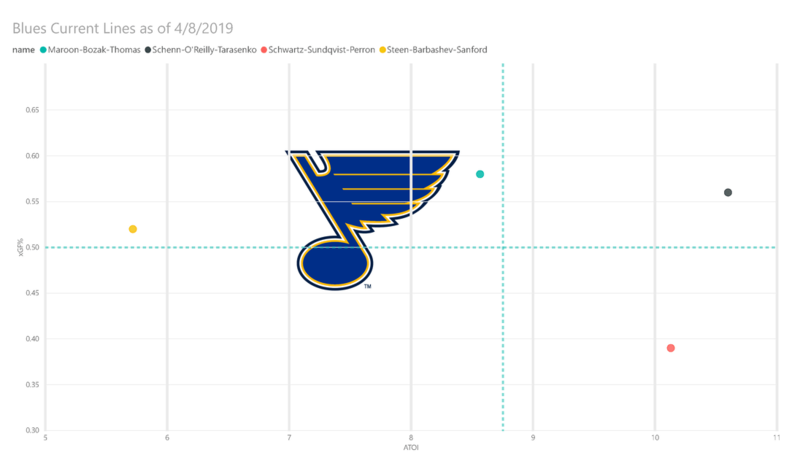 Below is a chart showing the Blues’ goals for percentage (GF%) and expected goals for percentage (xGF%), while Binnington is playing versus while Allen is playing. GF% is measuring the percentage of actual Blues goals scored versus opponents goals scored, and xGF% measures opportunities created by a team versus opportunities created by their opponents taking into account shots, shot selection, and distance to predict the amount of goals a team should be scoring. This chart is only taking the months of January, February and March into account, so it is not skewed by the fact the Blues played terribly as a team during the first three months of the season. 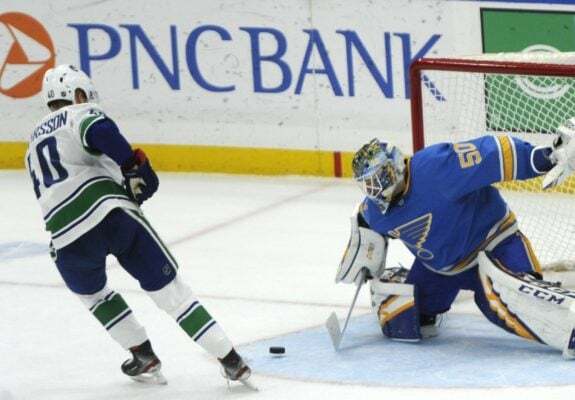 Not only are the Blues playing much better hockey in front of Binnington, but he is actually saving even more than he should be given how the Blues are playing. The reasons why the Blues play worse in front of Allen are probably a combination of things, including the fact that they often played him on the second game of back-to-backs and even luck. However, I think there is enough discrepancy to believe that the Blues play with more confidence in front of Binnington than in front of Allen. 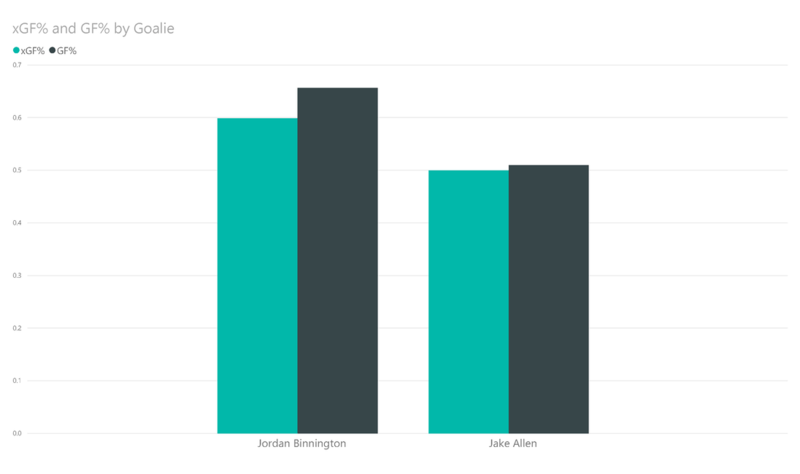 I also believe that Binnington is actually directly creating less opportunities because he is much better at controlling rebounds than Allen. The Blues must ride Binnington throughout the playoffs. This may seem obvious, but I could absolutely see the coaching staff decide to start Allen if Binnington runs into any type of trouble. The Blues have been so ready to give the crease to Allen over the years that we should not underestimate their ability to make this decision. I could see them thinking that Binnington is untested and Allen has had success in the playoffs in the past. They must give Binnington the benefit of the doubt even if he falters. I am not hating on Jay Bouwmeester, and truthfully, I almost regret writing this insight. He seems like a pretty upstanding guy and has had a great career, but I simply cannot find advanced stats that support him being one of the top six Blues defensemen. The below chart includes even strength xGF%, GF%, High-Danger Scoring Chances For Percentage (HDCF%), High-Danger Goals For Percentage (HDGF%), and Offensive Zone Start Percentage (OZS%) for every player who has played defense for the Blues this season. 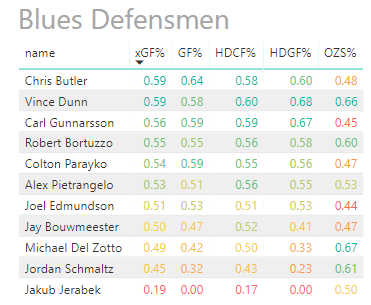 Not only does Bouwmeester give up more opportunities than his fellow Blues defensemen as measured by xGF% and HDCF%, but he actually performs worse when it comes to actual goals scored in GF% and HDGF%. Even when we look at the difficulty of the minutes he gets, his partner, Colton Parayko, still performs well despite getting matched up against the opposing teams’ top players. If we use OZS% as a proxy for difficulty of minutes, he does not even start the most in his own zone, with Carl Gunnarsson and Joel Edmundson starting in the defensive zone more often. Maybe there is some statistic I am missing, but at this point, I would start the playoffs with Vince Dunn, Gunnarsson, Robert Bortuzzo, Parayko, Alex Pietrangelo and Edmundson as the Blues defensemen. This will not happen, as evidenced by the new contract the Blues just gave Bouwmeester, but it completely ties into winning matchups. Bouwmeester plays a lot, and according to this data, his opponents are often winning the matchup when he is on the ice. The 2018-19 Blues are very deep, setting a franchise record for the most players with 10 or more goals with 13 different players. With that depth, they make it very hard for opposing teams to win matchups when they are playing well. However, after looking at their current lines from an analytics perspective, I think they should change up those lines. Below is a chart showing each line’s xGF% and Average Time on Ice (ATOI) per game. ATOI just includes the total minutes each line has played together divided by the games they have played together, so there will be situations during every game where the line is broken up, which accounts for the relatively low ice times across the board. Any line with an xGF% over 50 percent is creating more opportunities than they are giving up, and helping the Blues win line matchups. The top line including Brayden Schenn, Ryan O’Reilly and Vladimir Tarasenko has played very well together. Additionally, the third line of Pat Maroon, Tyler Bozak, and Robert Thomas has played exceptionally well, and the fourth line has more than held their weight. However, the second line, illustrated above by the red dot of Jaden Schwartz, Oskar Sundqvist, and David Perron is a problem. I like each player on that second line on an individual basis, but they are getting out chanced by opposing lines 60 to 40 percent. They also play a lot and that could cause a lot of trouble for the Blues if they are losing that matchup for a significant portion of the game. There are certainly solutions to switch up the lines or even promote the third line, but the Blues will need to shore up this weakness some way in order to be successful during the playoffs. Marginal changes tend to multiply together and create large impacts. Over a seven-game series anything can happen, but paying close attention to matchups and information that gives us more insight into individual matchups will improve the Blues’ chances of winning this series.